If you are looking to improve the performance of your vehicle, look no further. This package will offer you the performance and dependability you are looking for! This engine is ideal for streetrods, Corvettes, Camaros and other performance vehicles. 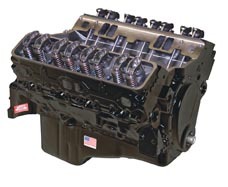 Priced very reasonably, this engine includes the block, Vortec-style heads, oil pump and timing cover. Specs are for the 330 hp 350 Chevy with Vortec Style Head version Jasper Stock Performance Engine. Other versions are available.